Meet The Pros: The Breeders, Judges, and Handlers Who Shape The DogSport! A multi-species animal trainer, top billed rodeo, horse show and theme park performer extraordinaire, this multi-talented woman is also a dog trainer and working German Shepherd Dog breeder. Joan Ronalder was born with a love for horses that intensified with maturity and experience and became nothing less than a psychic communication that also extends to dogs. Training animals comes as naturally to Joan as does her gift for totally engrossing and entertaining an audience. In fact, "showing off" and performing to thunderous applause seems to be what her animals like best. Her trick riding performances include the famous Roman style riding but on three horses instead of two. With top billing, Joan thrilled audiences from Canada to Mexico. 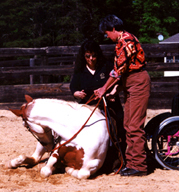 After decades of training horses and dogs, Joan moved on to become a nationally known multi-species animal trainer. 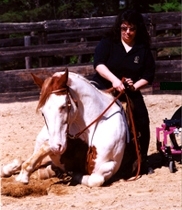 Joan personally trains her own horses, dogs, and other animals. She has also spent time training and exercising thoroughbred racehorses as well as training mules for pleasure driving and competition. Shoeing horses is an art in itself and Joan has shoed horses for Ringling Bros. Barnum and Bailey Circus and the Royal Lippizan Stallion Show. 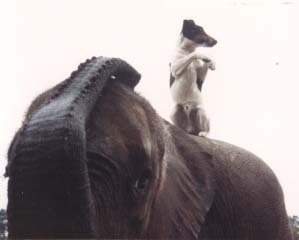 A vivid imagination and determination helped Joan become the top-notch trainer and performer with some of the most unique animal acts ever presented. A featured performer with Rodeos, Wild West Shows, Theme Parks and Circuses, Joan has amazed audiences coast to coast and even in Bermuda - which was a real challenge in moving and caring for the animals. Joan Ronalder's unique and totally original acts have entertained audiences at prestigious rodeos such as North American Rodeo Commission Finals, the IPRA (Texas) All Region Finals (FL) The American Professional Rodeo Association Finals (PA) The IPRA Southeast Region Finals (FL), The IPRA Northeast Region Finals (MA), The IPRA Southern Finals (TX), The IPRA Rodeo at Austin International Livestock Expo, and the Annual Gilbert Days Celebration (AZ) Golden Anniversary Rodeo (MI) IPRA All Region Finals (TN) and the IFR 24 and 29 in Oklahoma City, OK. Her most famous acts include the Indian Freedom Horse and the Dancing Appaloosa in “Taming the Wild One” and the Desert Scene Drama with the spectacular Paint Horse. Members of her superbly trained hybrid wolf-huskies team fly around the arena giving children a wild wheeled-sled ride they will remember for a life time! 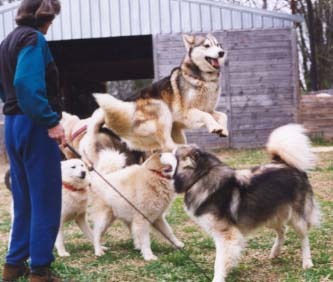 The dogs jump rope; go through complicated dramas; line up to take turns leaping astride Joan's palomino pony, and then, with both pony and “wolf dog” instincts under Joan’s compete control, the remarkable performance ends with four big wolf-huskies balancing simultaneously astride the galloping pony! After training a Dromedary camel "Randy" to perform, Joan she tackled the impossible, turning a fierce baboon (said to be un-trainable) into "Josh", the well behaved “kid” who made vet trips and guest appearances dressed in his western duds. 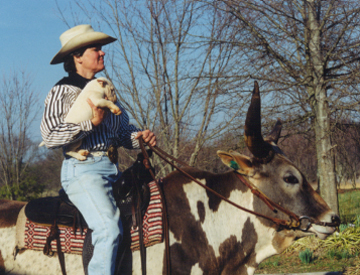 Joan has worked with buffalo and trained a Watusi-cross steer to saddle but she is best remembered as the supreme “bull rider” for her rodeo and horse show act with a Brahma bull under saddle. Among her many accomplishments, Ronalder trained a horse for an owner who is confined to a wheelchair following an accident 6 years ago. "Pawnee" the horse, lies down and waits patiently for his owner to transfer from her wheelchair to the saddle and then this remarkable horse gently gets to his feet with the rider aboard. To see the big horse lay down and patiently allow his owner to awkwardly mount is so touching that it brings tears to the eyes. 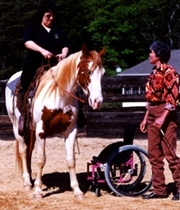 This is the second horse trained by Joan to be the legs for a handicapped owner. We show these photos in sequence because seeing is believing. We followed Ronalder's weeks of progress with this horse, from skittish and understandably frightened of the strange things she asked him to approach, to his calm acceptance of the wheelchair. Just getting a horse to step up to a wheel chair takes a huge amount of patience and an uncanny ability to instill confidence in an animal so naturally programmed to spook and flee from anything out of the ordinary. But to get him to lay down so close and so steady that the owner-to-be can pull herself from the wheelchair onto his back without so much as a quiver from the horse is almost a miracle. When the horse slowly and carefully sat up, then stood up, it truly seemed like a miracle to his rider. Even the photographer was moved to tears as the rider bubbled "Oh My God, I just went from no legs to four legs!" Joan Ronalder has an uncanny ability to communicate with animals and TheDogPlace.org is honored to have her talk with us!